Foot trouble? No problem. We fix them. at the Chamber of Commerce on April 26th at 6pm-9pm. We will also discuss Text Neck, Cell Phone Radiation and more. Follow us on Facebook for updates. 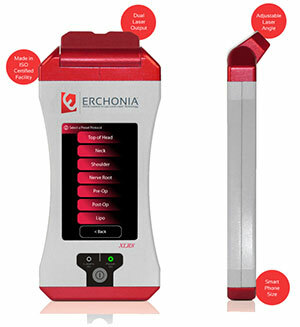 These are the first FDA-approved lasers in the world that can help alleviate chronic lower back pain, plantar fasciitis, chronic neck pain, post-operative pain, as well as various forms of shoulder pain are at the Health Center, created by the Erchonia company. These are revolutionary, hands-free cold lasers that provide mind-blowing results through trusted, innovative technology. It’s better than Star Wars! Both cold laser and acupuncture are transformative, with a history of years of studies showing their effectiveness. In my 36 years certified in acupuncture, I have never found anything as effective as combining these two modalities in the same session. It’s as though 1 + 1 = 20. I strongly recommend that you give it a try. Why nine sessions? You may feel improvement right away or you may feel improvement following several sessions, but remember that feeling improvement is just a change of symptoms. At the Health Center of Hillsborough, we look to bring about positive, permanent change, more than just relieving symptoms temporarily. We want you to be well throughout your life. We also have no hesitancy to grant discounts If you have a financial hardship. Did you sprain your ankle (your shoulder or your back) playing basketball with your son or daughter? Dr. Aaron has a friend who injured her wrist, she discovered a wrist wrap that gave her a great deal of relief. including the spine, at a price less than Amazon! Hemp Oil Complex is a unique formulation of ingredients, combined to provide a 3-in-1 benefit for the whole body – supporting the endocannabinoid system, inflammation response resolution pathways, and endogenous anti-oxidant pathways. Hemp Oil Complex is a combination of well-balanced polyunsaturated fatty acids (PUFAs, omega-3 oil) delivering essential fatty acids needed for the formation of specialized lipid mediators for a healthy immune response. Hemp oil and omega-3 oil may support the resolution phase of the inflammatory process by providing PUFAs which are known to be precursors to endocannabinoids. Additionally, Brassica (TrueBroc) is an important phytonutrient providing antioxidant support by activating the Nrf2/ARE pathways. Why support the endocannabinoid system? The endocannabinoid system (ECS) is gaining attention in the public eye for its role in contributing to an individual’s overall health and well-being by supporting the body’s physiological homeostasis. The ECS regulates nearly every metabolic process in the body system. A well-balanced ECS encourages favorable conditions in the body system, impacting the body’s ability to manage metabolic stress1 and may support overall health and well-being. Hemp Oil Complex™ includes calamari oil, dimagnesium malate, hemp oil (stalk and seed), TrueBroc®, and broccoli..